Hello. My name is Andrew Liszewski, and I’m an incessant finger tapper. Almost anything in reach can become an impromptu drum kit when I’m burning off nervous tension. It’s often incredibly annoying to those unfortunate enough to be in earshot, but soon my anxious behaviours could yield a future hit on the club scene with Sphero’s colour-sensing SpecDrums toy. Last month, Sphero, known for its rolling BB-8 toy that was an incredibly popular and hard to find holiday item when Star Wars: The Force Awakens originally hit cinemas, revealed that it was officially calling it quits on licensed toys. Sales of those bots, like its brilliant interactive R2-D2, all but dried up once the movies they were tied to left cinemas, leaving the company with lots of unsold stock it recently cleared out. As first revealed back in January of 2018, the decision was part of a larger initiative for the company to refocus on its educational roots, which resulted in a smarter version of Sphero’s Bolt robotic ball being released in September, and an acquisition of a smaller company called Specdrums back in June. Wrapped in a flexible housing, the SpecDrum wearable fits almost any finger. 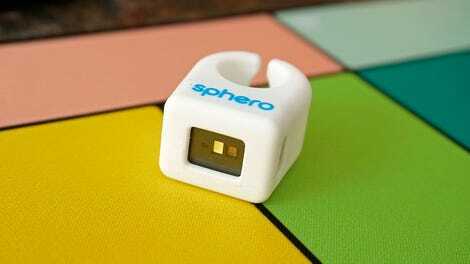 The idea behind the SpecDrums is a simple one, powered by an even simpler device worn on a finger, or multiple digits. It looks like an oversized, upside-down class ring made of flexible silicone, but packed with an optical sensor, LED, and a battery, instead of semi-precious gemstones. It’s essentially a compact MIDI device that triggers an accompanying mobile app to play sounds based on a given colour being detected. The SpecDrum starter kit includes a rollable play pad featuring a series of colourful keys that can be played. To ensure colours are detected accurately, the SpecDrum wearable uses a neutral white LED light that’s only triggered when an accelerometer detects a physical tap, illuminating what the ring’s sensor is seeing. In the GIF above, you can see its brief afterglow as I repeatedly tap on an included rollable play pad that serves as a simple eight-key piano. But the real appeal of the SpecDrum wearable is that it can detect the colour of almost any object that can be physically tapped, and trigger a response—like a sound, a sample, or a beat—and potentially other outcomes as well. The SpecDrums app functions like a basic digital piano, but the collared keys are triggered when the wearable detects each colour. Ahead of CES 2019 we had the opportunity to try out a finalised version of the SpecDrums hardware, but only an early-access version of the accompanying mobile app. It functions like a synthesiser, allowing you to play sounds, beats, or sound effects using the SpecDrum wearable (or by just tapping your device’s screen) with a limited amount of additional functionality that hints at where Sphero plans to take the toy. 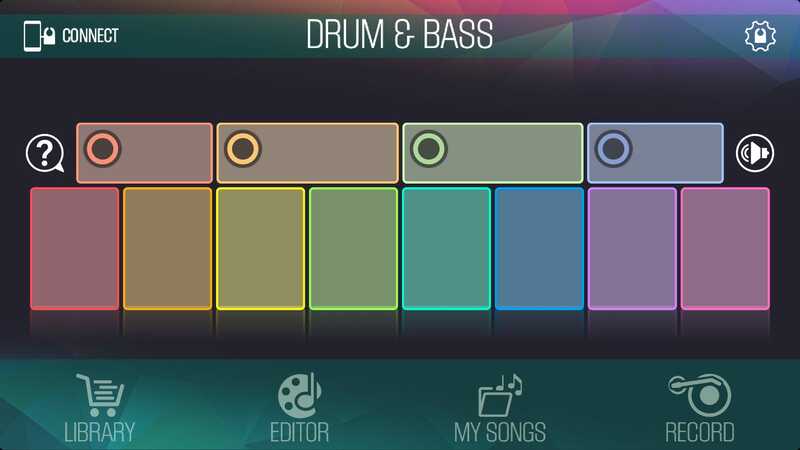 You can change the app’s default trigger colours to almost anything by simply tapping the SpecDrum sensor on a real-world object, and even custom record your own sounds to be played. The app also currently includes a small library of sound collections that can be downloaded and performed, which Sphero will undoubtedly expand once the toy is officially available. There’s even the option to record a performance, and hopefully, Sphero will eventually allow users to share sound collections online (assuming proper recording laws are followed) similar to how the company lets its users swap and trade custom programs with its other STEM-based toys. Will we soon see DJs in the club tapping their way through a set with SpecDrums sensors on every finger? Probably not. While the wearable is very responsive—it genuinely feels like you’re playing a tangible instrument—it will occasionally not register a tap if the sensor hasn’t made proper contact with an object or a surface. Sphero’s SpecDrums: Another good reason to buy more fruit.